Debuted by Corning Glass Works in 1915, Pyrex finally allowed for cooking, reheating, storage, and serving to happen in one handy dish. The clear Pyrex ovenware was a hit, and in 1947 the Pyrex Color line was introduced. Generally the most recognizable and sought after, these colored bowls and dishes came in many different patterns and shapes. Still highly collectable today, some favorite designs include Butterprint, Atomic Eyes, Snowflake, and Gooseberry (shown here). Cinderella bowls, with their tapered handles that double as a pour spout, are one of the most unique and popular shapes. Gladding-McBean & Co. debuted its Franciscan Pottery line in 1934. 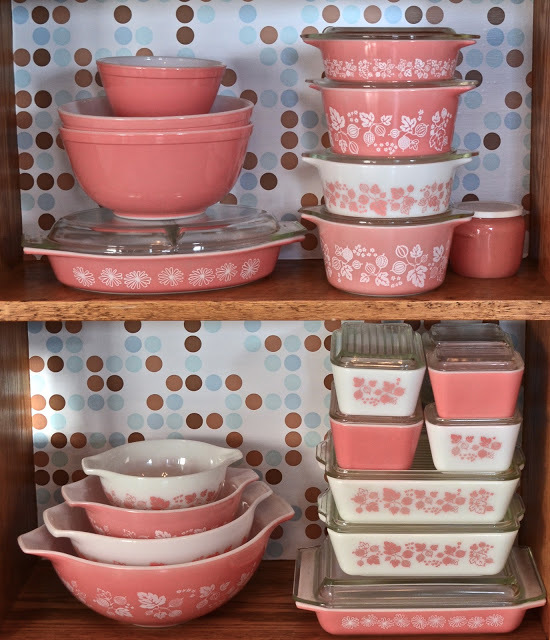 The Southern California company eventually changed their name to Franciscan Ware and launched the Starburst pattern in the mid 1950’s. 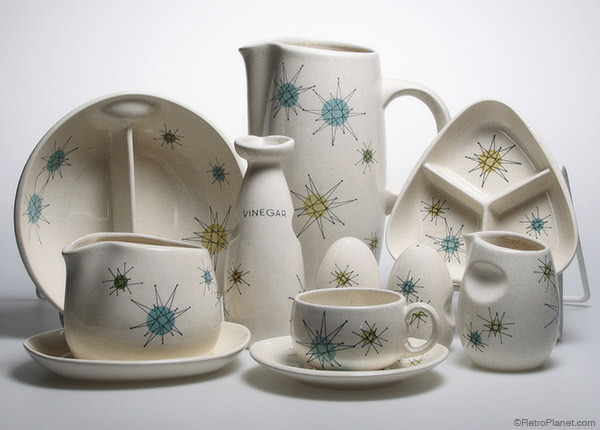 Perfect for the atomic age, the pieces include teacups, serving dishes, salt and pepper shakers, and sectioned plates. Don’t feel like scouring eBay for your own vintage set? Or perhaps you prefer to keep your authentic Franciscan Ware on display. Retro Planet now offers reproduction pieces ready for everyday use! 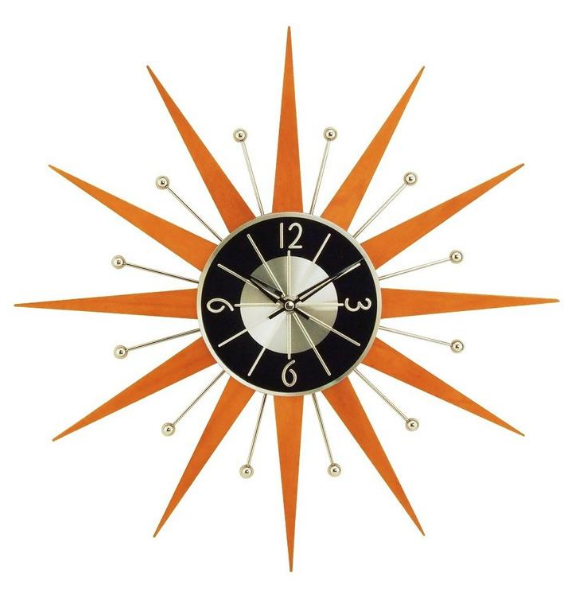 What kitchen doesn’t need a delightfully atomic starburst clock? George Nelson really helped to guide the movement during the midcentury with his innovative designs for the Howard Miller Clock Company. Though George Nelson clocks are still very desirable, the many designs inspired by his work are sought after as well. 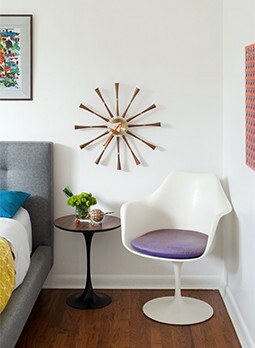 If you’re having trouble finding a vintage starburst clock, modern designers have made their own versions, including this bright Wooden Enok clock from France & Son. These atomic clocks look great on their own but hanging several on the wall would be out of this world! Produced by the Steubenville Pottery Company and introduced in 1939, Russel Wright’s American Modern dinnerware had a fresh new look that remained wildly popular throughout the midcentury. Created in several different colors, the American Modern pieces allowed for mixing and matching. The collection is still made today, exclusively by Bauer Pottery. 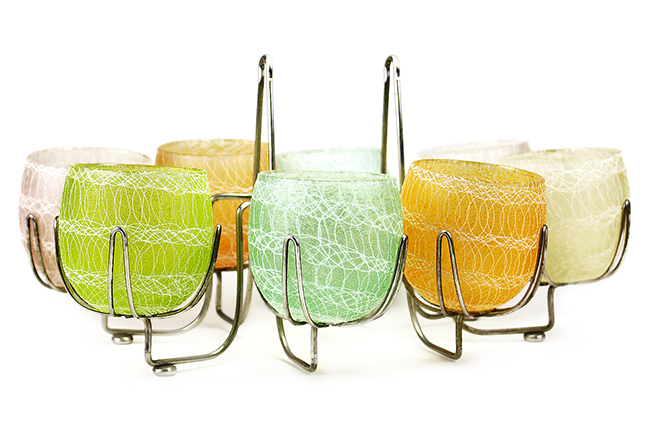 Usually thought of as the material for 1960s spaghetti string lamps, the plastisol coated glass material was also used for glasses and pitchers. This specific set is from the Shat-R-Pruf line, and the rubbery grip combined with the shatterproof material creates the perfect cocktail or juice glass. The particular shape of this set, termed “roly poly,” was aptly named for their round shape which leads to the glass always rolling into the correct stance. 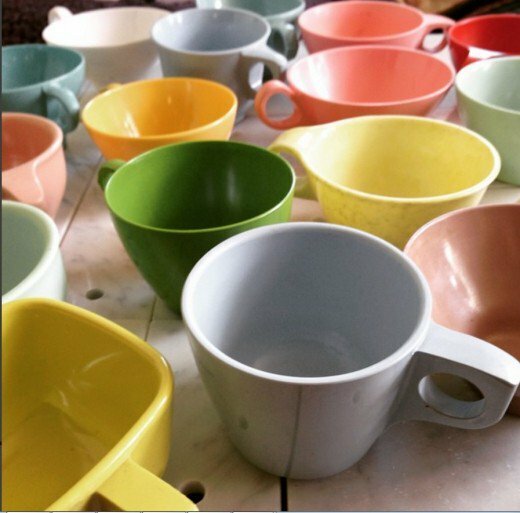 A huge name in vintage pottery dating back to the late 1800’s, Bauer continually met desires of the changing times. The Ringware collection was introduced during the 1930’s while the the Al Fresco, La Linda, and Monterey Moderne styles were wildly popular during the midcentury. 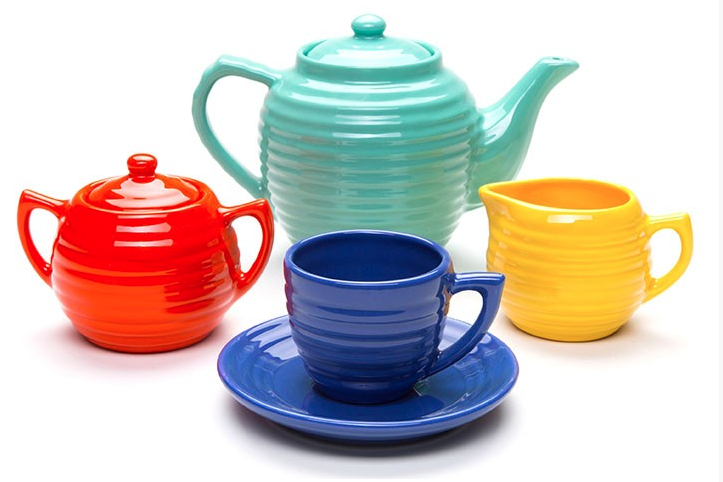 Seen here is a modern Ringware tea set from Bauer Pottery. Hosting a brunch party? 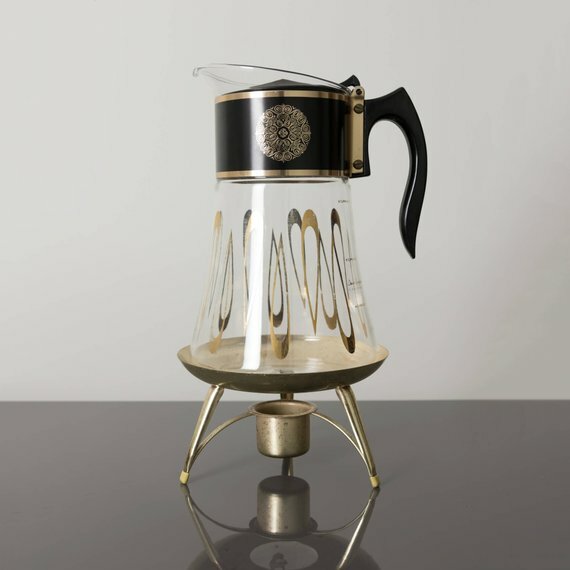 Serve your guests fresh coffee from a vintage starburst carafe! These beauties come in different shapes, sizes, and patterns. Designed to stylishly serve hot coffee, most of these carafes were used with a wire grid as they were not fit for direct stove contact. Some models even come with a warmer that allows for a votive to keep your brew deliciously warm. 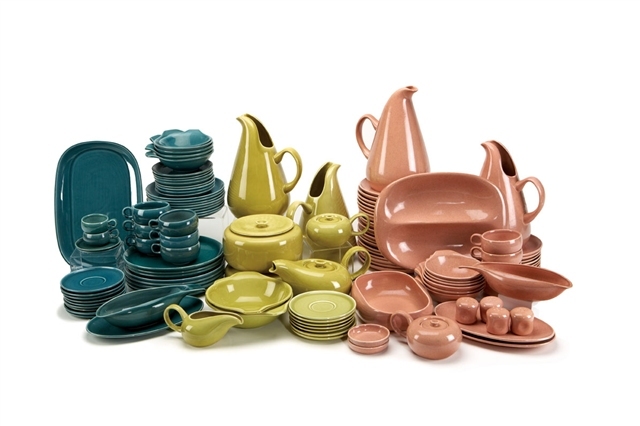 Colorful and collectable, plastic dinnerware was popular throughout the midcentury. Made from a thermoset plastic called Melamine, the American Cyanamid company branded the name “Melmac.” The long production run of Melmac means that we can still find full sets today! But perhaps it’s more fun mixing and matching these bright plastic pieces? Either way, Melmac continues to be the perfect choice for barbeques, picnics, campers, and everyday life. Nothing says ‘midcentury’ like a good ol’ gelatin mold! Jell-o salads were a popular party dish throughout the midcentury and ranged from simple dessert fruit dishes to hearty tuna or ham suspended in gelatin. 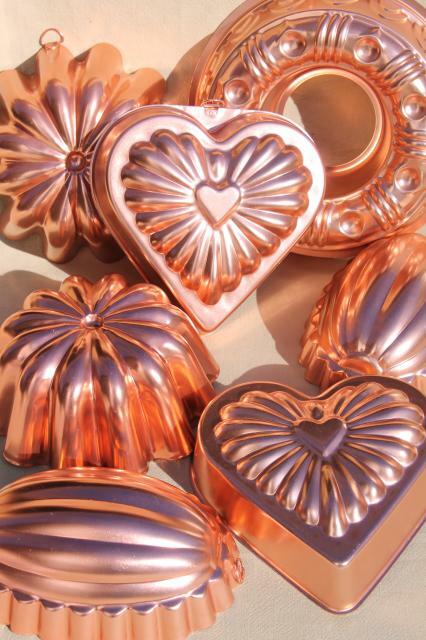 When not being used to create wobbly retro dishes, these molds look great hanging on the wall for added vintage décor. 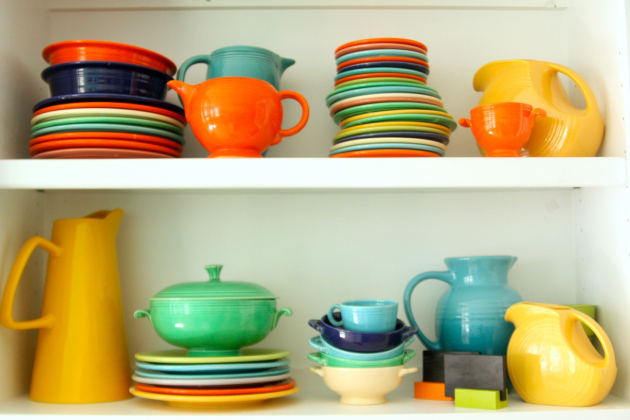 Fiesta® Dinnerware was introduced in 1936 and its customizable mix-and-match bright color scheme is still loved today. Fiesta Ware is currently available in many colors, but originally introduced in only yellow, red, blue (cobalt), green, and old ivory. The characteristic ribbed edging makes them easy to recognize, but some pieces will certainly be harder to find than others. Whether your collection consists of strictly vintage, strictly modern, or a mix of old and new, Fiesta Ware will surely brighten up any breakfast! 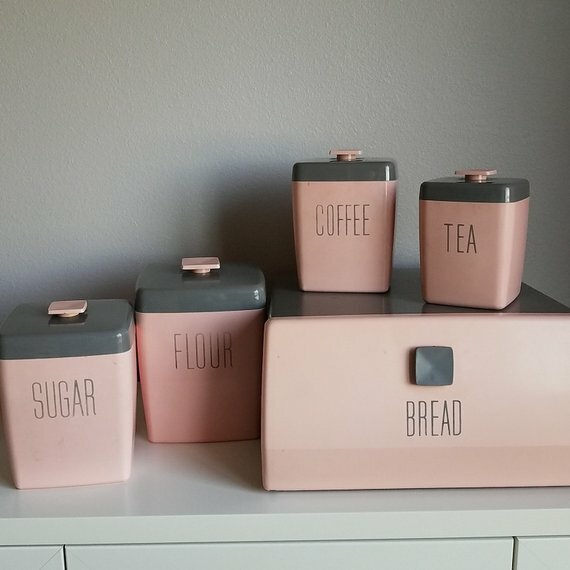 Not only do matching canister sets add an instant burst of retro to your kitchen, they’re also extremely functional and space-saving. Ranging from many colors and styles, vintage sets are relatively affordable and easy to find. You can also purchase bright retro reproduction canisters or have some custom-made to suit your taste.